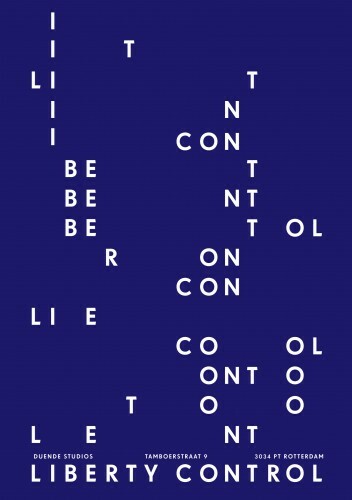 Liberty Control brings together 14 artists who are currently in residency programs at 5 artist initiatives in Rotterdam. 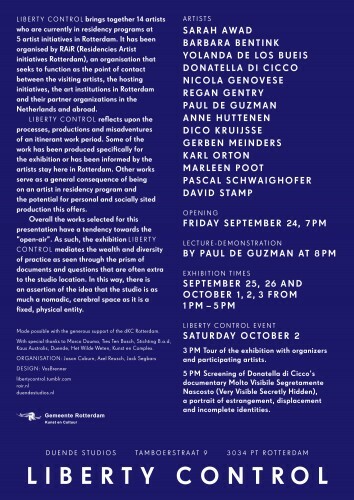 It has been organised by RAiR (Residencies Artist initiatives Rotterdam), an organisation that seeks to function as the point of contact between the visiting artists, the hosting initiatives, the art institutions in Rotterdam and their partner organizations in the Netherlands and abroad. Liberty Control reflects upon the processes, productions and misadventures of an itinerant work period. Some of the work has been produced specifically for this exhibition or has been informed by the artists stay here in Rotterdam. Other works serve as a general consequence of being on an artist in residency program and the potential for personal and socially sited production this offers.